Greek Default Watch: What Austerity? Austerity is killing Greece. Or so we’re told. The politicians and the press have a clear narrative: to please foreign creditors, the Greek government is cutting spending to such low levels that the provision of basic services is being compromised. The Greek people, who suffer under these cuts, are rebelling. That’s the story that one reads on a daily basis and it sounds good. Too bad it’s not true. Yes, Greece is cutting spending. But to call what Greece is doing “austerity” is like saying that going from eating five Big Macs a day to four is “a diet.” Reality is more complicated. Look at government finances. Basically revenues fell in 2009 but have since held flat. This is due to three forces. First, revenues that depend on work, income and profits have fallen due to more unemployment, lower wages and lower corporate profits. Second, the government has increased value added taxes on consumption, in part because these are easier to collect than direct taxes (where evasion is high). Third, EU financing for investment has increased, providing additional revenue to the treasury. These measures have kept revenues flat but since the economy is contracting, the ratio of revenues to GDP is at a ten-year high of almost 41%. So yes, there is tax evasion and revenues could be higher, but the state is taking in as much money as at any point over the last decade. Meanwhile, the increase in indirect taxes has plunged the economy into a deep recession as people have less disposable income. Deposits have fallen by 35% due to capital flight and dissaving. Wealth is evaporating. The reason can be seen on the expenditure side of the equation. From 2008 to 2011, the state cut €13.2 billion (-12.5%) in primary spending (excluding interest). But look closer and the “adjustment” evaporates: less public investment accounts for almost half of that drop, while much of the remainder is explained by less spending on defense, meaning the state is building less infrastructure and buying fewer weapons. Meanwhile, social benefits have risen and spending on wages has declined by merely 7%, largely due to retirements by civil servants rather than any rationalization in public administration. But consider something else. In 2011, primary spending was at 43.1% of GDP, down from 48.7% in 2009. Yet spending from 2000 to 2006 averaged 40% of GDP. So even today, the state spends three percentage points more than it did earlier in the decade. In fact, once you strip out capital expenditures (to control for the recent drop in investment), the state is spending 5.3% of GDP more in 2011 than it was in 2000-2006. In 2011 terms, that is a €11.5 billion difference, roughly the amount of money that foreign creditors demand that the state cut over the next few years. This breeds three big questions: why does the reduction of infrastructure and defense spending so compromise the provision of public services; why is it so outrageous to shrink the state back to its 2000-2006 levels; and why can the state not provide with 43% of GDP the goods and services it could provide with 40% of GDP? These are profound questions that go to the core of what is happening in Greece. Taxes are rising so that the government can buy time to shrink the state back to where it was a decade ago (as a share of the economy). The idea that the state is being starved and therefore cannot provide for its citizens is rubbish. Money is not the issue. The state is alive and well – in fact, it is eating better than it was a decade ago. So much for a diet. Hey Nikos, great piece, thanks. We have the same issue in the UK which is by all accounts practising austerity but which I have read is in reality, similarly to Greece, still spending significantly more now than it was shortly before the crisis hit. The great (as in large, not as in good) machinery of the State is an excellent device when it comes to swallowing money. It cares not where it comes from, but boy does it know how to spend it. It is quite amazing how easy it is, not only in Greece, to increase government expenditures and how difficult it is, not only in Greece, to reduce them. I think most people in Greece would be happy to return to the "austerity level" of 10 years ago. The numbers would suggest that they are still far from it and yet, 10 years ago there was not nearly as much unemployment as there is now. Unemployment is, to me, the most critical issue of all. Why is it that unemployment has rocketed so quickly and so high? One has to remember that GDP in 2011 was "only" 7% below the record level of 2008. That is not a depression-era slump which would justify such high unemployment so quickly. In Germany, unemployment is quite easy to understand (I think). When exports go down (or rather: when exports grow less rapidly), unemployment goes up. What are the triggers for Greek unemployment? It seems to me that Greece could employ a lot more of its own people if it produced a lot more of the stuff which it presently imports. From that standpoint, Greece is actually in an easier position than Germany. Germany always has to race for new exports to keep its people employed. Greece only has to reduce imports and substitute them with domestic production and unemployment would go down. Or am I making a mistake here somewhere? I saw that because I saw some traffic to my site from Varoufakis' blog. I have been called many things in my life but "confused" is not one of them. Nor have I ever heard that reading numbers is "arithmetical confusion." Anyway, if I thought he cared to have a genuine discussion I would engage but I don't think he is, so I don't bother. 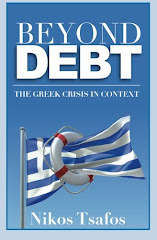 "In the three years from Q4 2008 to Q4 2011, the Greek economy shed 657,000 jobs. Three sectors which make up 34% of the country's total employment (there are 21 sectors in total) accounted for 67% of the lost jobs, led by construction (160,000 jobs lost), manufacturing (146,000) and wholesale and retail trade (111,000). There were also some sectors where employment actually grew, albeit modestly: "financial and insurance activities" and "human health and social work activities." So I think you're right that domestic production could make a difference but I also think that Greece could generate a lot of economic activity purely through internal exchange.